Savoury, you ask? Yes. Savoury. Giam giam. Not sweet. I personally don't really like too-sweet stuff, and don't eat sweets. I don't dig cakes, brownies, and desserts of the like. Generally I'm more of a traditional local desserts person. Think 白果腐竹薏米, pulut hitam, orh ni...okay orh ni was probably the ONLY jelat dessert that I'm a fan of. I remember waiting for it EVERY TIME I attend a wedding dinner. If it's not orh ni when the dessert comes, "Okay everyone, we'll catch up soon! *whispers* Don't wanna get jammed up in the carpark later~". Lol~ 现实啦！I know!!! 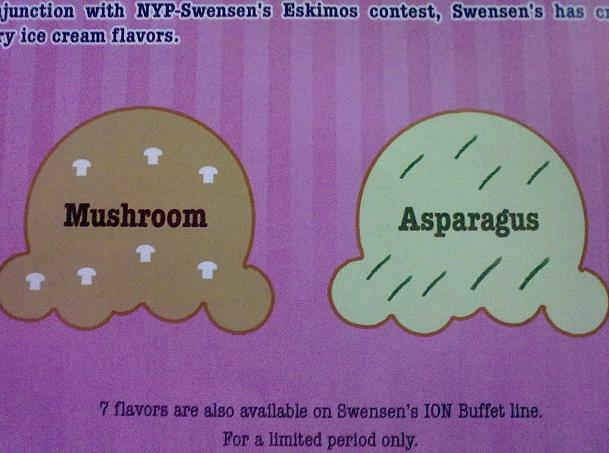 Anyways~ *waves imperviously*, I got invited to the Swensen's at Ion to try out their new Savoury Ice Cream flavours! This was a collaboration between Nanyang Polytechnic's Scool of Chemical and Life Sciences, and Swensen's. They co-organized this "NYP-Swensen's Eskimo's Battle", which was a competition for secondary school students to come up with their own ice cream flavours, and is already in its second year running! This competition was set up to create awareness of NYP's Diploma in Food Science and Nutrition, and I must say, I think it worked pretty well! Swensen's selected 5 flavours from the finalists' recipes, and launched them last month. Cool or what? Imagine you're just a secondary school student, and you can tell EVERYONE you know "哦，我的 ice cream 啊？你去Swensen's 就有了咯." WOOT!!!!! If you want your creation there as well, just join the next Eskimos' Battle! Who knows, your flavour may be a permanent fixture in Swensen's!!!! 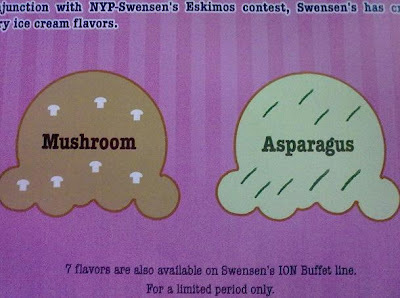 Swensen's came up with 2 of their own savoury flavours as well!!! I had a super hard time finding Swensen's at Ion though, because it was like outside the main shopping area, behind a pillar. -.-" I circled the whole of Ion basement 1 around Lobby B area (they told me it's near Lobby B) twice before asking this Standard Chartered guy at his booth. It was just opposite him WTH~ BEHIND the pillar. And the entrance was still like, under construction or something, cos that part of Ion seems unfinished. Oh well, now you guys know. When I was told Swensen's Ion has a Ice Cream and Dessert Buffet, I was like "A what??? I gotta see this!!!" Complete with plenty of strawberries and marshmallows! Next, they have over 50 flavours of ice cream to choose and binge from! Heeck, they even have Gelato!!!! Since when Swensen's have Gelato!!!! OMG!!!!! If you're wondering why I'm so excited over the gelato thing, it's because I used to work at Venezia, this FANTASTIC ice cream place. More on that another time! There's Durian flavoured ice cream and durian gelato. TAKE THE GELATO. It is REALLY D24 taste!!!! All the savoury flavours are available in all swensen's outlets in small tubs, but at Swensen's Ion, you get to have it in scoops from the buffet spread! There are biscuits, toasted garlic bread, and croutons to go with savoury flavours!!! Fresh fruits to go with the sweet flavours! A huge variety of toppings to choose from...including Attap Chee!!! You can have brownies, bread and cookies to go with your ice cream too!!! OMG!!! This reminds me of the Ah Pek selling ice cream outside my school with his bicycle, or do you call it a tricycle or trishaw??? You know what I'm talking about right? Then you'll get your ice cream with crunchy bits like Oreo inside!!!! YUM!!!!! Swensen's is proud to say that they are the ONLY place in Singapore to sell Halal-certified Wagyu Beef. Muslims rejoice!!!!!! You can FINALLY get to taste what all the hype about this wagyu is!!!! They specially catered to the kids with the burger, and senior citizens with the rice! (The beef is softer!) How thoughtful!!! Swensen's is having a lunchtime 1-for-1 promotion now as well!!!! Weekdays from 11am to 2pm, as long as the 2nd meal ordered is of equal or lower value than the 1st, it's free!!!!!!! With this and the great new ice cream flavours, plus the ice cream and dessert buffet at Ion, do you STILL need more reasons to SO go to Swensen's again? I went alone for the tasting so there was no way I could try EVERYTHING. I'm so going there for my next gathering of sorts!!! I'm SOOOO going back to Swensen's!!!! !